It's only been two weeks since Oreo unleashed the new, highly breakfast-able Cinnamon Bun-flavored cookies, and now, the classic sandwich cookie maker has already unveiled yet another crazy, all-new flavor from its mysterious "Wonder Vault": Filled Cupcake. We visited a pop-up portal to the "Wonder Vault" in New York on Tuesday morning to get a sneak peek at the new cookies, and of course, eat them. While they look similar to original Oreos on the outside, inside you'll find a rich, chocolate frosting filling and a "surprise" dollop of creme filling in the middle -- just like a filled cupcake. In terms of taste, the flavor is exactly what you'd expect from a cookie designed to taste like a chocolate cupcake: sweet, chocolaty, but not quite like a cupcake. Like every Oreo ever, they go great with a tall glass of milk. Packages of the cookies will hit store shelves on February 8th, for a limited time. Oreo claims the new cookies are "unlike anything we've ever done before," and that it spends 12 to 18 months developing new flavors, some of which are held for years inside the "Wonder Vault" before they're released to the public. 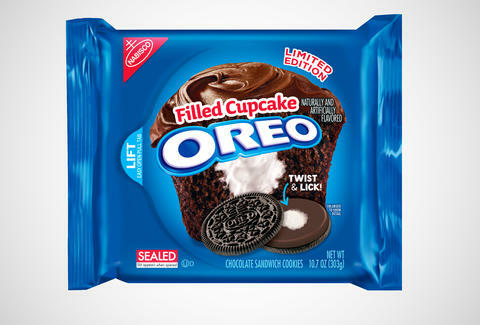 That said, Filled Cupcake is one several limited-edition flavors Oreo's got up its sugar-coated sleeves this year, but we dare them to top red velvet. Tony Merevick is Cities News Editor at Thrillist and is going to need more milk over here, guys. Send news tips to news@thrillist.com and follow him on Twitter @tonymerevick.